Temporal bone tumors can be characterized as benign or cancerous. These type of tumors are both extremely rare; however, cancerous tumors are alarming. Cancerous tumors are usually formed when the cancer of the skin invades the outer ear and ear canal. These cancers are most commonly squamous cell carcinoma of the ear, ceruminomatous adenoid cystic carcinoma, or adenoid cystic carcinoma of the ear. 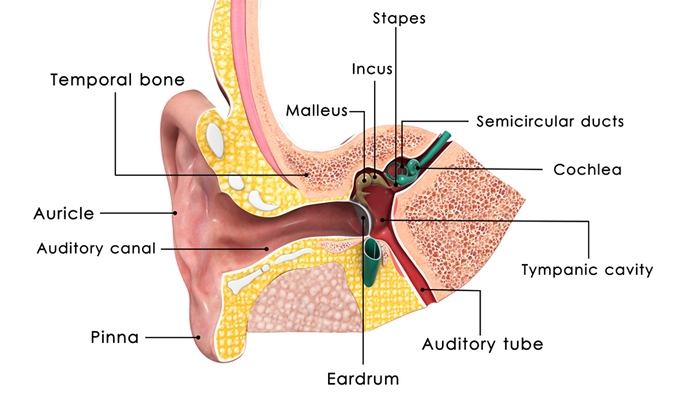 Other cancers of the ear are probably caused by invasion from nearby structures like the saliva gland, which is positioned in front of the ear canal. While benign ear tumors may result in hearing loss, cancerous ear tumors can cause a pulsating sound in the ear. While small tumors can be removed through the ear canal, the surgeon may need to cut an incision behind the ear to remove large tumors. Depending on the location of a cancerous tumor, the patient may require radiation after surgery. A procedure known as the sleeve resection can be performed if the tumor is positioned on the outer 1/3 of the ear or the cartilaginous ear canal. If the tumor is located near the inner 2/3 of the ear canal or the bony ear canal, the surgeon will perform a lateral temporal bone resection, which consists of removing the entire ear canal, ear drum, the first 2 bones behind the ear drum, and possibly the parotid gland, jaw joint, and neck lymph nodes. Sometimes the ear drum and hearing bones can be left intact. When a tumor is located in the space behind the ear drum, a procedure known as the subtotal temporal bone section must be performed. This procedure consists of a blend of operations from the lateral temporal bone resection as well as removal of certain sections in the inner ear. Although surgery can be performed when a tumor is inside the inner ear, there is not a very good prognosis. Due to the technicality of the operations, many medical centers only perform a handful of these type of surgeries per a year. Successful treatment for temporal bone tumors usually involves an experienced medical team including radiologists, reconstructive surgeons, neurotologists, oncologists, pathologists, and head/neck cancer specialists. The goal of these professionals is to provide the necessary information that will enable patients to participate in the decision making process. Afterwards, the team will develop a personalized plan for every patient.